After the release of the new site design last week we received a considerable amount of feedback. Since then we've rolled out additional improvements, style adjustments, and bug fixes. Some changes are more subtle than others, so I wanted to call them out individually. Our first priority was to fix any bugs we introduced with the new layout. I believe we've addressed most (if not all) of the bugs found during the rollout. If there are any issues you're still seeing, send us a note over on our site feedback forum and we'll get it taken care as fast as we can. Reduced padding in a number of areas - in page headings, filter lists, etc. With the rollout of build guides, we heard your feedback that price sliders were hard to use for lower budget systems. We've made improvements there, so please check it out again and let us know what you think. We did receive suggestions to bring back the old site layout. That is not likely to happen. The new site layout also incorporated numerous backend changes and performance improvements that are no longer practical to backport. Additionally it would be a substantial amount of work to maintain both versions of the site. We also received suggestions to move the filters from the left side back to the right side. We made the change in our development setup and tested it - in the end it wasn't something we felt looked right. Filters will remain on the left side. Yes! I love alternate dark themes for websites. Much easier on the eyes, especially at night. I know there are browser add-ons for these sorts of things, but I haven't found one that is suitable for every site I visit. Sometimes it works, and sometimes it doesn't. I would prefer a local solution if possible. Yes! I would LOVE a PCPP dark theme. Agreed! If only someone could build an extension that, god forbid, works! :D lol no but really, I "fourth" this idea! I use Google chrome, and the extension that I find that works the best would be stylish, if you want a dark background the people from the large community have most likely made one (which they have) as I am using this :). That's awesome! Using it for Firefox now. It works extremely well. Thanks for the tip! That would be more than helpful, especially on my phone. If we get enough people to want a darker theme they might change it. Actually, I think I would prefer a theme based on the old site's colors. YAAAAASSSSSSSSSSSSSSSSSSSSSSSSSSSSSSSSSSSSSSSSSSSSSSSSSSSSSSSSSS but seriously a dark theme is amazing on most sites (just for variety), but on PCPP it would be amazing. I would appreciate feedback so I can improve anything that is still a bit off. Please leave any feedback under the userstyle or on the LinusTechTips forum link above. Also there is the standard dark theme on LTT (scroll down to the bottom and on the left side you will see "Change Theme" and select "Night Theme". Personally I think it is too dark. Why do people always want a dark theme ?! This one is not even bright, you could lower your monitor's luminosity. What I think would be an interesting feature would be the possibility to add a caption to uploaded pictures (maybe with a character limit, 140 just like on twitter would be plenty enough). Black background + orange text isn't necessarily as readable, but reduces eyestrain. Also, that's not necessarily true in low light levels. The Slider thing though.ITS AMAZING!! Great improvements, Philip. The new design just keeps getting better and better. Keep up the good work! The design choice behind having 1 additional click to get to the parts by hiding them under the header is an annoyance that I can't see as a necessity, given it's not saving any more precious vertical pixels than before. Just the "Blog > Title" alone has around 20-30 pixels of useless padding. If you count that with other parts of the website such as: comments spacers padding and circular avatars, you can see there's a very heavy focus on looks, but there's not much in terms of efficiency whatsoever. I get it, touchscreens are a thing now. I'd like to believe our fingers can be fairly accurate though, and this design is overstating the amount of screen real estate it really needs. The improvements made to the loading of lists and overall website speed are hindered by these design choices that asks us for more redundant actions: more clicks, more scrolling. I still like the design, I just believe we could use something that balances efficiency and looks in a more cozy and compact environment. The site redesign wasn't aimed at touchscreens, though they do benefit from the new layout. Compact and data dense layouts are good for a subset of people. Others find it overwhelming and leave. We are trying to balance the needs of a larger and more diverse user base than when I first started the site. So there are efficiency gains in the redesign, but you have to look at the bigger picture to see it. I'm an engineer by trade, and I like really data dense site layouts. That's why the original design was what it was. But what became evident over four years of iterating was that it became very limiting. Literally every feature addition or improvement caused a struggle of where to place things, because everything was already so tightly squeezed in. There was so little room that it became a huge constraint. When new users came to the site, they were overwhelmed with the options and left. So in the end, we tried to strike a balance. Make the site more approachable, but retain all the configurability and functionality of the old site. Some will only see more scrolling and an extra click to get to part categories - I get that. But one thing that was telling to me was that in the days after the rollout, we had several pcpp expert users come to us and say that "Wow, feature X is fantastic! Thanks for adding that!" Only, those features had been there for a year. They were literally in the same area of the page as before - it was just that the density of the old site made them very difficult to discover. Hmn, I thought I had come up with some good criticism but after this reply, it's very obvious why I'm not a designer. I want to note that I'm not against experimenting or trying to expand your user base with new concepts. Since you gave a good reason for why things are as they are I have no complaints on that part, no view fits all after all. Ultimately, I simply want PCPP to be the best it can, at the very least I know the people behind it is still striving for that, and that makes me happy. The amount of scrolling now necessary to navigate the site is killing me. And it could be fixed so easily...why waste half half of my screen on every page with the ridiculously huge sidebar? All that empty space on the left (and this effects a lot of pages) could be utilized and make it so I don't need to scroll nearly as much. There is never much information in the sidebar, so why not move it to the top of the page? It wouldn't look quite as nice, but would also spread everything out a lot better and make it so everything isn't awkwardly squished onto the right side of my screen. I'm currently on a 4:3 but I'd imagine it be even worse on a 16:9. The amount of scrolling and the weird right-lopsided design is really subtracting from the user experience for me, and making the site a daily visit to an occasional one. Perhaps you could have the sidebar be able to be hidden, like in the image below? Please? I think this is a very good compromise. I'd really like yours or the designer's input on this. P.S. Other than this I love the new design, and the mobile site is the bomb-diggity. 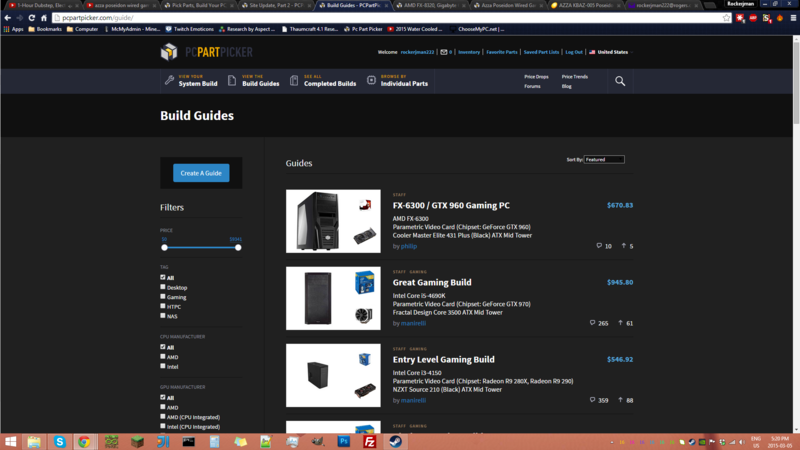 Can PCPARTPICKER have a LED section? I want to balance all the complaints you got in the last week by saying: thank you for continuing to work on the site! May the staff continue to bring many more improvements to PCPP. I have some thoughts on Filtering; First, Parametric filters should respect the sorting applied to them. B) it would be great if they could include word-searching. Being able to specify "PRO" when looking for Samsung SSDs would help avoid EVO models. I really like the slider improvment, and the new layout in general. I don't really like the new color scheme tough. Prefered the old one. Other than that I really like it! I've noticed that when you're looking through multiple pages (for example: completed builds) when you change pages it leaves you at the bottom and you have to scroll all the way up. Because it isn't available for purchase from the retailers that they track. The slider update makes everything easier. I used to have to up the slider up a bit so it can register in the address bar and then edit it there. Now you don't have to do that! Another idea: Add in the infinite scrolling in like the options or something! Maybe the preferences or something? I love the new layout and changing the price manually on the slider is right on point. One suggestion: would it be too cumbersome to add thumbnail pictures to the parts lists? I say this because I and many others are trying to do color themed builds and it's a real chore having to go to the page and back to the list over and over to see what the part looks like. I'd just be happy to see all of the products listed showing accurate and available pricing. There are a LOT of components that were showing pricing on the old layout that are no longer showing any values in those fields despite being readily available on any number of the listed vendor sites. I'd also be glad to see a more accurate reflection of the available hardware. If the hardware is NOT available, from any of the listed vendors, it shouldn't even show in the filtered list. Dears PcPP , the market going toward mobility sizes products, the ARM, embedded systems, and low power consumption units are available now with reliable performance , and will grow more and more, there is an "Xeon® Processor E3-1220L v3 " processor witch its only 13 wat, we are now in 18 nanotechnology. I hope you get some more attention to this small from factor and low power parts, Thanks. An update to build guide sorting should be coming tomorrow. 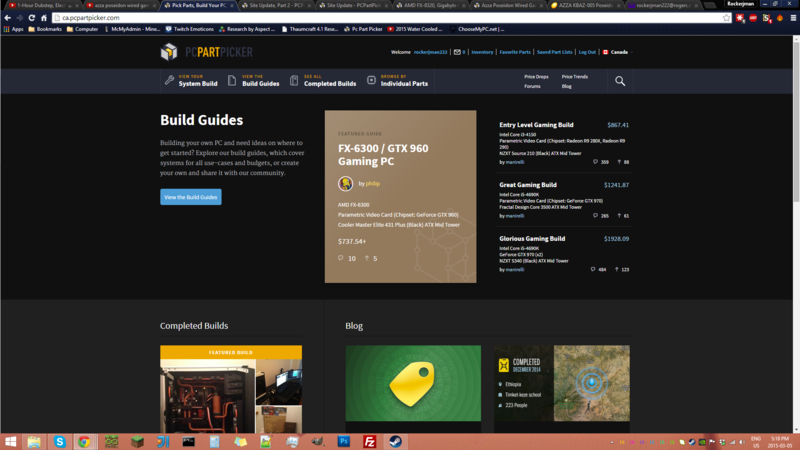 my build guide section is broken. when i use the slider for the price range the page stops working. it says "an error has occurred"??? What browser and version are you using? Also, do you also see a similar error when trying to add a part to your part list? a, i just tried it today and it seems to be all good. i don't know what was wrong? by the way i am using Google chrome Version 40.0.2214.115 m, if that is any help. Is there any way to start a new build without having to build it on top of your current list? I have been looking for a "New build" button for a little while now, but the only solution I can find is to save it over my current build and not overwrite it. Save your current build. Start new build at top. Remove all button. Thought so. This just seems a little clunky compared to the previous option, which allowed you to just start from a blank build. BUGS! It shows me that there are two XFX XTR PSUs, a 550 and 650. The 650 is $80 but it shows that the 550 is $66. But, if I click on or add the 550 one to my list, it tells me that it's $80! GET THE PRICES RIGHT. Looks like you may have caught a part between pricing updates. Are you still seeing this discrepancy on the site? I see the 550 at ~82 dollars and the 650 at ~80 dollars. First of all, let me just say that for some strange reason, it feels like an honor having you reply since your part of the staff! But no, I'm not seeing this problem on the site anymore. It's weird, though. The prices changed right after I posted that message! i like the new site, even though i still kinda miss the old one. not many sites can pull off a new look and yet still be comfortable to use. the slider thing will be a welcome change, for sure. I'm with some of the other people not liking how all of the part choosing pages are in a drop down kind of thing, it just doesn't seem intuitive to me. After years of research and development, it was finally made... Visual new car smell. This site is now more beautiful then it was while equally useful. I love the new design and as I am getting used to the new layout of things, I learn to love it even more. Keep up the good work! Thanks for the update. The slider one improvement will be very useful. I was going to suggest that you look into your slider using the log scale. That would increase the ability to select lower price ranges. Your solution of manually typing them in works too. Overall most changes are improvements. Site is more useful than ever! Keep up the good work. Awesome! I personally thought the first update was great, and this is even better! Would it be possible for build guides to disappear after a certain number of downvotes? If you could make them disappear once they get -5, it would make it so a few experienced members could clear out the crappy ones. Any updates on mobile app? Prefer the old design. But, beggars can't be choosers, I guess. Thanks for actively working to improve PCPP. When you go to your inbox, it brings up any new messages, however i noticed if i go to private messages then back to inbox, it doesn't work, i keep getting the private messages only. Please fix. Thx! i dont like how you press the arrow buttons to go to the next button, the photo doesnt change. I also don't like not being able to add/update parts with updated prices to previous builds. For instance i added more ram to my build and i didnt pay as much for the new sticks, but i cant seem to add the new sticks to my list. The ability to integrate a text search into a parametric filter would be nice. I can't make a filter to include only WD Red hard drives because the only way to separate Red from the others is with a text search. In addition, the ability to use some kind of search syntax to search for multiple terms. For example: "Dominator" + "Vengeance" when searching for Corsair memory but wanting to exclude all but these two product lines. I'm a 63 year old kid who appreciates the work you have done here. I am delighted to have a place to go to work on computer builds/wish lists without having to "make a list" in XL or whatever. 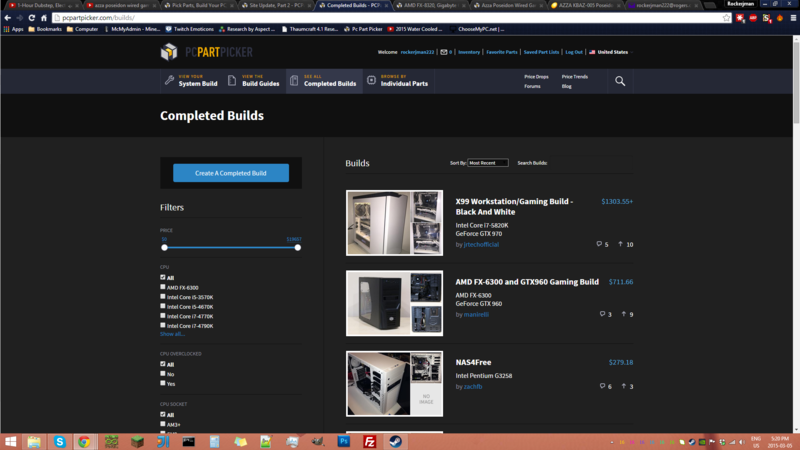 PCPartPicker.com allows the luxury of adding any and all options I can think of...being able to select products and have pricing available (not to mention monitoring price changes/sales/rebates) is a time saver. I really like the "add a custom part" section. I just copy and paste model numbers, descriptions, etc., etc., and pop in the cost and link to the manufacturer's site. What a treat. 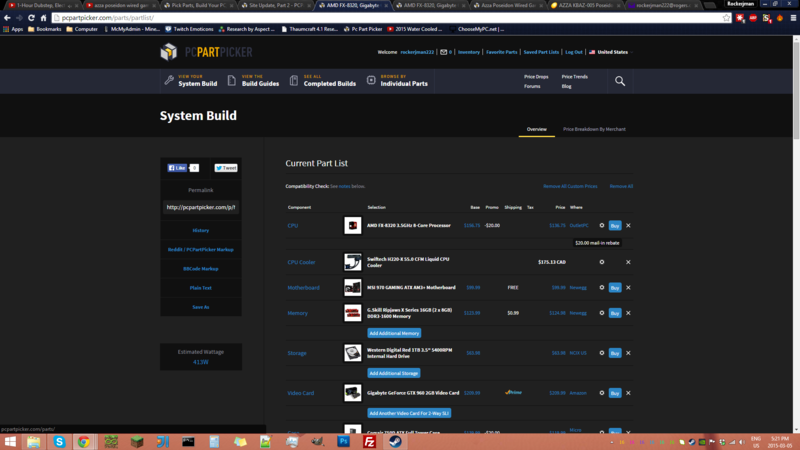 The completed builds section is also great. I don't consider myself to be be a novice nor am I an expert so this section allows us all to see what other builders are doing/thinking. As for the design...for me it's clean and easy enough to work thru. I am confident the site will continue to grow and offer good information for the computer build community. Nice work and thank you so much for your efforts. next time slowly make the changes as i( i dont know about others) had trouble convincing myself this was the actual site with a new design. How about the ability to hide comments? It is really annoying to go through all sub-comments of a comment to read the next comment. Just visually appealing and easy to read through the comment section. Also, if you do add this usability, then I think you should consider minimizing the main comments on the initial view; if there are any sub-comments show a plus sign next to the post or top left. If they are interested in reading what others have to say about a user's comment, they can expand it, else just read the rest of comments. Any plans of going mobile(android or iOS) as well? the only thing i wish you guys would remove is having pages when looking for parts, it makes it impossible to compare items on multiple pages. <!-- Since you took the time to look at the page source, here's an ascii art rendition of a famous spider (1). And for what it's worth, PCPartPicker pays its server bills on time and with real money rather than renditions of spiders. Seriously, you're still reading this? Any updates on App progress? Maybe some hints to when it will come out? frankly, the mobile site is really solid... mobile app bloat is just more stuff to support when the web interface works perfectly fine. 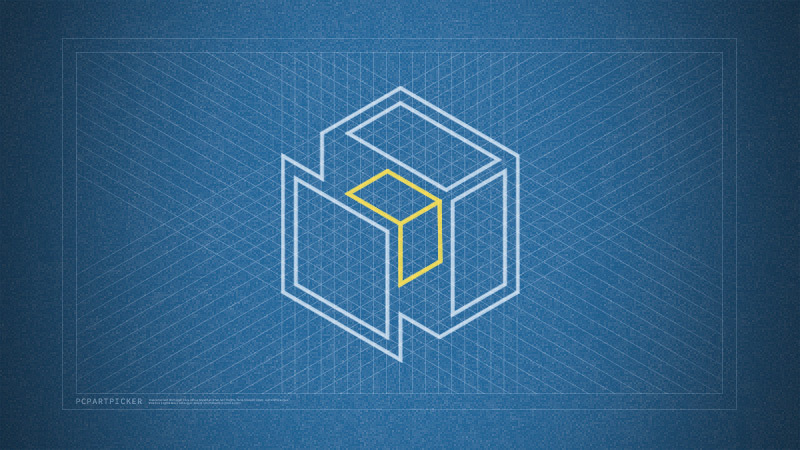 What would you gain from having an app that isn't already on the mobile site interface? You can get that by just bookmarking a page for offline access... again, nothing really that isn't just as easy with a web browser. Change is hard, but I like the look overall. It looks modern and sophisticated. Glad you like it! I think philcoffman has the original in vector format, so I'm sure we can generate one in 1080 for you. He's out of the office for the next week or so, but I'll ping him when he gets back and have him send one to you. Looks very good, simple and elegant. The fact that improvements are made through filtering community feedback is a best practice in terms of web design. Still crap revert to old layout please. Wow, with such polite feedback let me get right on that. No one can say you're not a funny guy. Hey Philip. I know that I am a bit late, but can you please make a PCPartPicker app. Thanks. Hi! The site update is a really nice move! It feels really 2015 compared to the older interface. That being said, if you're still taking feedback, I would ask if it would be possible to include the country selection in the profile management. I am from Canada and I got to change from U.S. to Canada each and every time I log onto the site (Or does it work with cookies and I block them?). I'm cool with it but it would be a nice addition to the already beautiful and useful interface you've just created. Very much prefer the new layout. Keep it up!